It’s been said so much that it’s almost cliché, but the wealth management industry is being disrupted in ways we’ve never seen before. From robo-advice, to changing client expectations due to demographic shifts, firms are finding themselves having to transform their business models not just to keep up—but to remain viable. 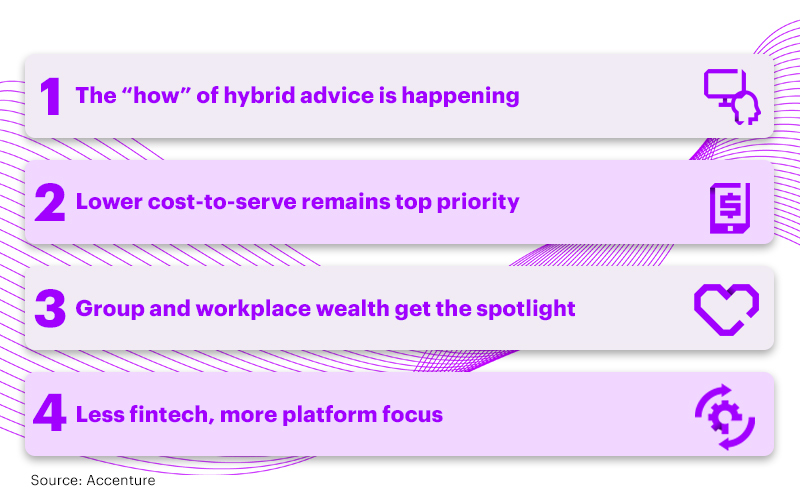 Investors want a hybrid advice model, as Accenture research shows. In 2019, I am sure we will see firms taking big steps forward to mature, integrate and evolve hybrid models. Helping to spur this move is the fact that the robo new-entrant landscape continues to mature rapidly, with key players making strategic decisions. At the same time, incumbents are working to make their offerings more robust and sustainable for the long term. A rich hybrid experience is emerging, with more sophisticated digital tools available for advisors. Much of the heavy lifting will happen internally—behind the scenes—as executive teams, business units and value propositions merge. Expect to see more offerings like Schwab Intelligent Advisory, which combines humans and digital technologies in a truly hybrid scenario. Both incumbents and new entrants will continue to acquire and test new plays as a result—from offerings as simple as Wealthsimple’s Roundup, to more complex plays like the Robinhood checking account. This flurry of activity—the fail-fast method so key to innovation—will likely separate the small group of relevant digital players from a large group of original entrants. As a result—I believe we’ll see the continued maturation and integration of hybrid offerings in 2019, marrying the client’s full needs with the digital capabilities necessary to meet them. Cost take out is back at the top of the list because being able to scale at a low price point demands a lower cost-to-serve. In 2019, we will begin to see cost innovation in earnest from vendors and incumbents looking to go head-to-head with new entrants. I don’t just mean robotic process automation and business process automation—I mean true innovation in the form of end-to-end digitization, virtualized support and utility plays. There is plenty of work still to be done to drive the cost-to-serve down in a fee-compressed environment. Many incumbents may not yet be competitively positioned to deliver at scale this year in this fee-compressed landscape, yet the transparency created by digital environments means they must in the future. As they remove costs, leaders will repurpose the freed capital across their operations to fuel innovation. Put bluntly, they need to in order to compete with lower-cost, nimbler new entrants. The workplace is no longer viewed as a stale market, but rather seen as a possible new frontier, with a lot of untapped potential. Technology has evolved to support an investment experience that moves beyond simple administration. More firms see financial wellness, which is an offering or program designed to improve employees’ financial health, as a value-add that could drive growth. My team and I see a flurry of requests for modernization, as traditional players look to expand their service offering to better compete in this space against new players like Nest Wealth. Large incumbent firms will up the ante, expanding employee financial wellness content. Leaders will tailor the employee and employer financial wellness engagement and experience, as they have in other market sectors. Digital will play a large role in this sector, as it does in all others. We are also seeing a focus on the lower end of the mass market, particularly from U.S. players. As they dive in, they might disrupt banks. We expect a shakeup on the bottom end of incumbents’ offerings, one that may benefit investors in this segment—moving beyond underserved, high-fee and self-service options. We should see in time some game-changing offerings to serve this segment. Keep an eye as well for a new point of view from us on this topic coming soon. After a bevy of San Francisco roadshows by digital startups, it’s time for incumbents to move into action mode, getting their platform of the future built. Even for some of the largest players, this task seems to be proving daunting. Recently, at the InvestWest conference, I heard a lot about this struggle from industry executives when I presented on how to realize a hybrid advice model. Being smart about investments in innovation—not getting distracted by the “noise” of emerging technologies—is key to building an intelligent wealth platform. But many firms are finding it hard to sift through the landscape of new players and technologies. First movers, though, have begun to rebuild and modernize their wealth platforms to accommodate a changed marketplace. In 2019, they should be in a good position to benefit from this work, enhancing their platforms to become even more flexible and data-rich. As a recent Aite report puts it: “Firms are aware that as clients get more discerning and as regulations reduce the number of opportunities firms have to engage with their clients, it is imperative to turn big data into bite-sized information that is relevant to each client.” A good platform enables this capability, and a host of others—many fueled by artificial intelligence. This is an area of the business in which first movers really do have a distinct advantage—but fast following is better than not following at all. While none of us can claim a prescient crystal ball, I firmly believe these four areas are the ones to watch (and invest in) in 2019. And I’m having some rich discussions with many of you on these very topics. As always, if you’d like to discuss any of these ideas in more detail, don’t hesitate to email me, Kendra Thompson. Here’s to a 2019 in which your firm takes charge of its own disruption—helping to shape itself for a successful future. Next Post - Thriving in the New: First Mover or Last Responder? Suggested Post - Thriving in the New: First Mover or Last Responder?